Need your college football fix? Watch the 2010 Senior Bowl here. Enjoy. It’s a long time till September. The first hour of Pres Obama’s first State of The Union Address was the most divisive, partisan, and bitter SOTU that I have ever heard, in my entire adult lifetime. And, I’m no spring chicken. The last half hour wasn’t any better. I do wonder if the Republic will survive this charlatan. My fear is a complete collapse of the economy. If I’m right, there will be much to do to prepare for life in this post-American, Obama world. Take care of your families. Update: Here’s an interesting video from the jellytoast blog. Two years ago, Obama gave the dem response to Pres Bush’s final SOTU. This is the first time I’e seen it, because at the time, I had no interest in seeing it. It is remarkable in that it is basically the same speech he gave tonight, with one notable exception: Obama claimed that the surge failed. If we had followed Obama’s plan to immediately begin withdrawing from Iraq two years ago, then he would not have been able to stand up tonight and shamelessly claim credit for ending the war in Iraq. Iraq would be a complete basket case. Obama was wrong then, and he hasn’t changed a bit. Update 2: Nile Gardiner (Telegraph) grades the speech an F on international leadership. Democrat Underground, however, thinks Obama is God himself. And if you can’t see that, well, you’re just blind. Obama gives Kentucky Wildcats the K.O.D. President Obama’s 0-fer streak continues. What began as a thank-you call for Haitian relief efforts to the top-ranked Kentucky Wildcats became the latest example of the Obama Kiss of Death. Final Score, South Carolina 68 Kentucky 62. A young woman of God by the name of Latonya has decided to start a Christian Blog for women. Please support this young lady as she discusses topics about relationships. Her blogs are for women of all ages: who are single, married, divorced, dating etc……and each blog includes reference scriptures. If you or other Christian women you know have questions or insightful wisdom they can add, please visit: http://wisdomforladies.blogspot.com. Best wishes to you Latonya. Hope your new blog is a smash! I’m adding a link to Wisdom for Ladies in The Roll, right-hand sidebar. We cry, Because We Remember: We remember Betsy; We remember Camille; We remember when the Saints were not a big deal. We remember Katrina; We remember the Dome; We remember the night, the Saints came marching home. We remember the bags; We remember the Aints; We remember those no longer with us, who simply loved the Sa…ints. We cry, because we remember; No matter the score; The Saints time is now, at Superbowl 44. 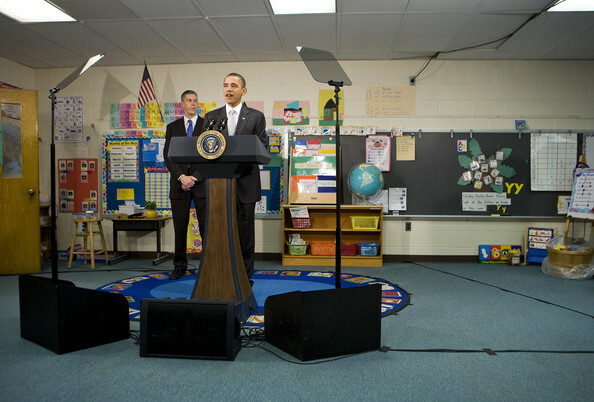 Obama visits first sixth graders. Brings along trusty teleprompter. You cant make this shite up. That standard is sadly lacking in the Holder Justice Department. While some conservatives doubted that the man who helped facilitate the Marc Rich pardon and overrode the recommendation of career attorneys to give Bill Clinton a favorable recommendation on the pardon of 16 Puerto Rican terrorists in 1999… was up to the job, he was confirmed by a vote of 75-21 with the support of many Republican senators. Bill would give president emergency control of Internet. Probably more appropriate to DHS than DOJ, but all thugs look alike to me. DOJ declares war on DOMA. Who is Ellie Light? Obama astroturfer? Just add them in the comments section!